Today’s Saturday Supplement is another in the occasional Meet the Roaster series. Today we’re in Leeds, at North Star Micro Roasters, who have been going for just over a year now. I went to see Krag and Ellis, the guys behind North Star, back in the summer as part of my Coffee Spot tour of Leeds. Roasting with a 5 kg Toper in an industrial estate just north of Leeds, North Star is that city’s first micro-roaster, which is a quite a surprise considering the strong coffee scene in the city and in the nearby Harrogate and York, which, together with Leeds, make up the Yorkshire Coffee Triangle. There’s also a strong roasting presence with the likes of Holmfirth’s Grumpy Mule, while in Harrogate, Falcon Speciality is one of the country’s leading green bean importers. However, Leeds’ wait for a speciality coffee roaster to call its very own ended last October when North Star started production. There are two espresso blends, the seasonal Czar Street, which changes three to four times a year, and the Dark Arches blend. Added to this are around eight single-origins, roasted primarily for filter, but with some roasted for espresso. August 2017: North Star moved the roastery to Leeds Dock last year, opening a cafe in the space next door in July this year. Expect an update soon! The journey to speciality coffee for Krag and Ellis, the pair behind North Star, is instructive and rather atypical since neither is a chef and neither has been to Australia or New Zealand. In fact, Krag came to speciality coffee through chocolate and his girlfriend, who, admittedly, works for Falcon Speciality. Originally from Leeds, he went to Africa to research the (historic) slave trade. While he was there, he visited coffee farms in Malawi and Kenya where he saw first-hand the difference that buying ethically made to the farmers. Back in the UK, Krag worked in the chocolate business in York, but with his girlfriend starting work with Falcon, his interest in speciality coffee grew. About the same time he became a regular at a coffee shop in Harrogate where he met a barista called Ellis and the rest is history. Krag quit his job to set up North Star and brought Ellis with him. Krag focuses on the roasting, while Ellis gets out more, visiting customers and looking after the training side of the business. 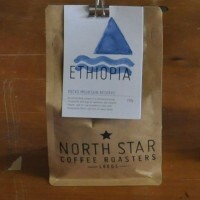 North Star’s aim is quite simple: to roast the best possible coffee. However, it goes far beyond this. As Ellis told me, it’s all about building relationships, not just shipping bags of coffee. This is where the training comes in, particularly in the case of North Star, where the focus is on bringing speciality coffee to a wider market. North Star’s philosophy is that micro-roasters shouldn’t be competitors; instead they should be working together to raise quality across the board. Rather than trying to get into existing speciality coffee shops, which often have strong relationships with established roasters, North Star is focusing more on the mid-range café and bar market. While welcoming business from anywhere in the country, North Star sees itself very much as a local business, with the majority of its accounts in Yorkshire. Typical customers are those with great products, but for whom coffee has far too often been an after-thought. By working closing with the owners and by training the staff, as well as supplying them with excellent beans, North Star is lifting the quality of their coffee offerings and bringing speciality coffee to a wider market. Of course, this is an on-going process, which is where the relationship building comes in. An example of this is a single-origin Nicaraguan espresso that Ellis made for me. This is roasted for a local bar, Sandinista, playing on the Central American connection. It’s the sort of location where you wouldn’t expect to find speciality coffee, but it’s the ideal place to expand the market. It was, by the way, a lovely espresso, very smooth and quite complex in flavour. In this respect, North Star very much reminds me of the approach taken by Glasgow’s Dear Green Coffee. The other similarity is in their shared passion for ethical sourcing. Here, North Star work very closely with Falcon to ensure that sustainable prices are paid for all the coffee and that the coffee is traceable to source. I finished my visit by sampling one of North Star’s single origin filters, a Kenyan Kiango, another fine example of North Star’s output. I have traditionally struggled with Kenyans, but a few more like this and I will have to change my opinion! For a different perspective, you can see what fellow chocolate and coffee-blogger, the Commodities Connoisseur, made of North Star during a visit in 2015. Liked this Coffee Spot? Then check out the rest of Leeds’ speciality coffee scene with the Coffee Spot Guide to Leeds. This entry was posted in Leeds, Meet The Roaster, Roastery and tagged include by Brian Williams. Bookmark the permalink. What do you mean by ‘ethically sourced coffee’? I assume you do not mean FairTrade, which is a con to make middle class coffee drinkers feel good, locks farmers into permanent poverty for commodity coffee. I assume you mean direct trade, transparency, where farmers are paid a much higher price for quality beans, where importers like Falcon and coffee roasters like Square Mile and Union form long-term relationship with growers. So yes, the coffee farmers are paid a higher price for quality beans and yes, the importer (Falcon in this case), forms long-term relationships with the farmers.